The Norton Museum of Art in West Palm Beach opens its new front doors tomorrow after a $100m expansion, while preparing to say goodbye to its director of nine years, Hope Alswang. She has raised the museum’s contemporary art profile, including its dedication to work by female artists, in addition to steering the building project, designed by the Pritzker Prize-winning architect Norman Foster. “We had an adequate but undistinguished facility that one board member had likened to a gymnasium in a public college in Minnesota,” Alswang says. The Norton’s building and campus now embraces its luxurious Florida waterfront site. Anchoring the new 59,000 sq. ft wing and entrance on South Dixie Highway is a magnificent 80-year-old banyan tree, its expansive boughs bursting through a cut-out in the polished stainless-steel cantilevered roof of the addition. The tree—which Foster calls “the protagonist of the whole project”—had previously guarded the Norton’s service entrance. The museum originally opened in 1941 in an Art Deco building that unfolded symmetrically around a central courtyard, with a waterfront- facing main entrance. It housed masterworks of European, American and Chinese art collected by the Chicago industrialist Ralph Norton and his wife, Elizabeth, who wintered in Palm Beach. Additions in 1995 and 2001 moved the main entrance and additional galleries to one side of the building, accessed from a large car park. “Architecturally, the institution had lost its way,” says Foster, who has reorientated the museum entrance to the main road and reinstated its original east-west axis, creating a beautiful sightline through the building to the water. There is a dedicated auditorium, indoor and outdoor dining, new classrooms and 50,000 sq. ft of gallery space, an increase of 35%. The famous banyan shades a huge window on to what Alswang calls the “living room”, a public space with lounge seating and a coffee bar, aligned with the courtyard and 1941 entrance. The former car park has been remade into a lush garden studded with recent gifts of 13 sculptures by artists including Ugo Rondinone, Keith Haring and Jenny Holzer. 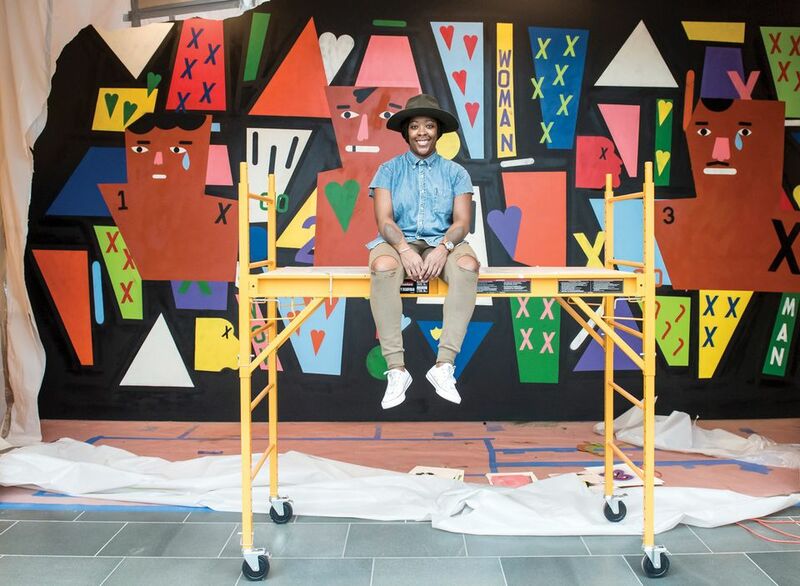 The Norton Museum's expansion opens with a show of paintings by Nina Chanel Abney © Nina Chanel Abney. Photo by J. Caldwell. Courtesy of the artist, Jack Shainman Gallery, New York and the Nasher Museum of Art, Durham. The transformed museum showcases how Alswang has grown the collection by nearly 25% to 7,600 objects, particularly in the areas of contemporary art and photography and work by female artists. An inaugural show RAW: Nina Chanel Abney (9 February-25 June), with new paintings by the New York-based artist, is the latest in the exhibition series Recognition of Art by Women, launched by Alswang in 2011. The programme has given Klara Kristalova and Svenja Deininger their first US solo museum shows, and Njideka Akunyili Crosby her first solo museum show anywhere. Other inaugural exhibitions include Going Public: Florida Collectors Celebrate the Norton and Oldenburg and van Bruggen: the Typewriter Eraser, a Favoured Form (both 9 February-4 June). Both shows shine a light on significant donations, and promised gifts, from collectors with homes in the area, such as Howard and Judie Ganek and Ronnie Heyman. “The board wanted a beautiful building to attract gifts of great art and be a major landmark in the community, which is still culturally under-resourced,” Alswang says. 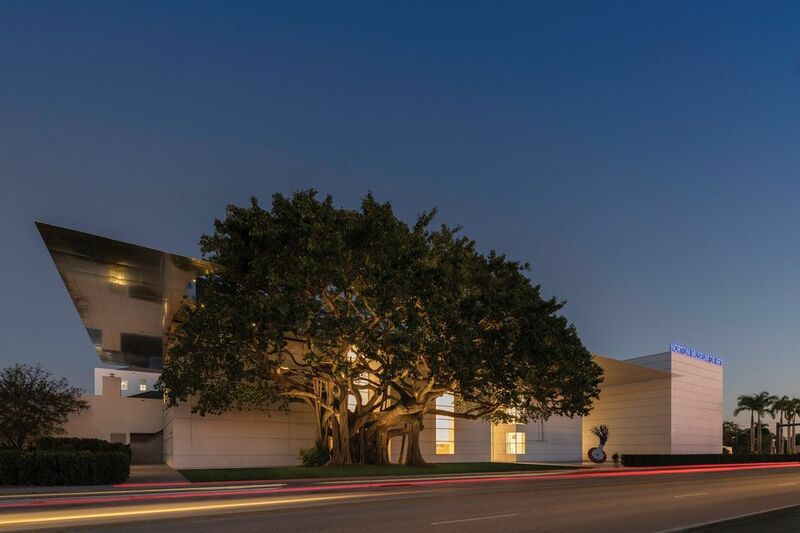 Even with the proliferation of arts organisations further south in Miami, the Palm Beach area has few cultural institutions other than the Norton and the Boca Raton Museum of Art, which is also completing a renovation. The area is home not only to the vacation properties of the Norton’s wealthy donors, but also a population that is rapidly diversifying in terms of age, ethnicity and economic background. The enhanced facility now offers free entry on Fridays and Saturdays. “We’re very committed to being a friendly place and are cognisant there’s a huge opportunity for adult learning here,” Alswang says. When she retires on 1 March, Alswang will pass the baton to Elliot Bostwick Davis, who has spent 18 years at the Museum of Fine Arts, Boston, as head of the Art of the Americas wing—also designed by Foster. “I’m really interested in looking at art museums as places that promote human flourishing,” says Davis, who hopes to expand on a research programme she launched in that area at the MFA. She will be the third woman in a row to lead the Norton, a run that started with Christina Orr-Cahall from 1990 to 2009. For Alswang, the building project has been a rewarding opportunity to apply just about everything she has learned about museums in her 45 years in the field. “To be able to accomplish this late in my career—it’s a great way to go out,” she says.